Building Your Own Outdoor Aviary? Sunlight interacts with the oils from our parrot’s uropygial gland (which are spread throughout the feathers during preening) and converts to vitamin D3 in the body. Vitamin D3 has a large role in the body’s ability to maintain normal calcium levels in the blood and to absorb calcium, which in turn determines our bird’s bone, feather and beak health. Sunlight supports the immune system and greatly reduces the chances of developing cancer. It helps overall organ function. Sunlight has sterilizing qualities and kills bacterias on feathers, toys and cages. Sunlight wards off depression and fatigue – in all creatures. We bird lovers are all over this and are looking at safe ways to take advantage of that big yellow thing that rises into the sky every day offering all of these glorious benefits – and for FREE! Not to mention the fresh air! As a result, many people are looking at ways to build their own aviaries. There are some serious safety issues that need to be addressed, though, before you try this. 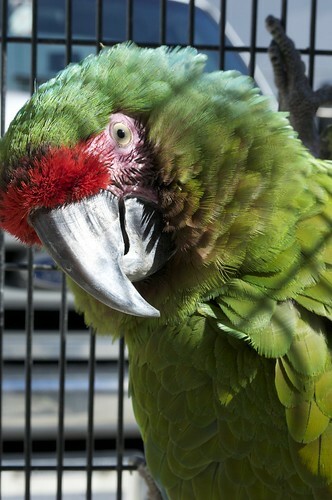 We want your birds healthy, but we also want them safe from injury, toxicity and predator attack. It takes a lot of careful, thoughtful planning to build an aviary. Most that are not designed commercially are works in progress. Just about everyone I know who has built their own has discovered flaws in their planning and has had to rebuild or modify their aviary. Plans that look good on paper do not always worked out well in construction. The places where the sides meet each other and the top of the aviary are one of the places where injury occurs. If they are not spaced properly or are unsteady they become areas where toes, beaks and wings can become caught. A gust of wind shaking the sides of one person’s aviary resulted in the loss of an entire foot of their bird. Most of us are not engineers. However, most of us are talented enough to erect an enclosure that is cube-shaped. It seems logical that this would be sufficient for an aviary. Unfortunately, this design is responsible for the escape of many parrots as we enter the aviary. Commercial designs include an small area outside of the actual aviary (called a catch-hold) that you enter first and close off from the outside before opening the door to the aviary. Also, aviaries that are set directly on the ground might leave birds vulnerable to animals that can burrow underneath it to get in. Most people wouldn’t think to consider that fact. This might be the most important consideration in your planning. Almost all materials standardly used in construction of outdoor structures are made of things that are TOXIC TO BIRDS. Chain link? Toxic! Galvanized hardware? Toxic! Pressure treated woods? Toxic! NONE of these can be used around birds. Birds are chewers and they explore with their mouths. No one can say with certainty that their bird will not investigate a particular thing in their environment. Your “never-gets-into-anything” bird might shock you with what he does get into when you aren’t looking. The unfortunate truth is that to build a an aviary that meets all the necessary construction, design and materials safety standards, it won’t cost you a whole lot less than most commercial aviaries.This is mainly due to the right materials being unavailable at reasonable costs because of lack of demand. I also found this company, based in the UK, that has a reasonably priced product. They sell powder coated panels to your specification that are bolted together. 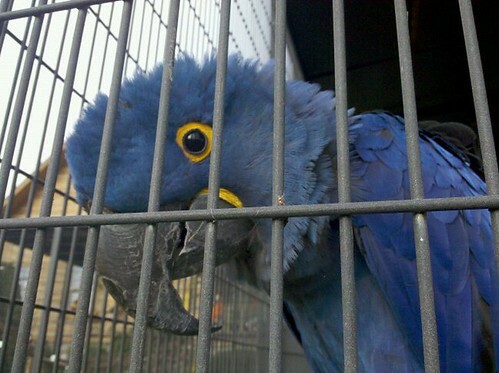 The total cost of an 8X8′ aviary would be about $1100 – before shipping. Unfortunately, this does not include a catch-hold, but one could be added. 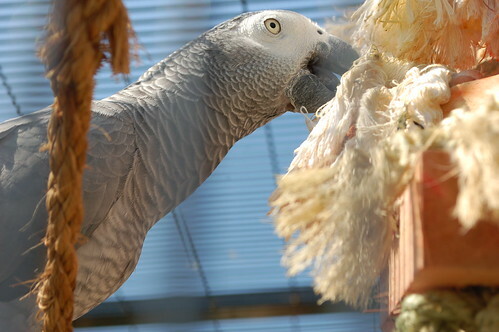 This post isn’t meant to scare you away from building your own aviary, but rather to encourage you to be extra careful in your planning of one if you do. I have mentioned above a few of the things that can go wrong in aviary planning, but there are certainly more to consider. It would be very sad to learn that someone who cared so much about their bird that they took the time to build an outdoor aviary had a death or injury as the result of their good intentions. Evelyn we had a problem like that but it was a hawk who grabbed one of my cockateils who was perched on one of those perches you attach to the screen. The hawk grabbed him by the wing tip ripped his feathers out and must have done other damage because his flight feathers still have not grown back on that side. The attack happened in late August of this year. I planted some grape vines to grow along the outside of the cage a little as a second screen. It looks nice, the birds like it better as they don’t feel as exposed and hopefully the hawk will leave them alone now. I have been breeding birds for 46 years in outside aviaries here in Victoria Australia. Temp range -2 deg C to 49degC. None lost to weather. My main aviary measures 4m x2mx2m.80% of the roof covered with colourbond, 20% 4mm wire to allow access to sunshine and rain.The rest of the cage is 4mm wire attached to a metal frame bolted together in 2m x 2m panels. Access is through a safety area 1.5 m x 2m x 2m full enclosed except for the doors. I use this area for storage of seeds etc. I breed Indian Ringnecks, Redrumped Parrots, Barrabands and Cockatiels at the moment. I have successfully bred in the past, Scarlet Chested and Turqoisine parrots, King Parrots,Many colured parrots, Bourkes parrot,Budgies, Canaries, Masked dove , Peaceful doves, Diamond dove,Peachfaced ,Masked Lovebirds, Cutthroat finches,Cuban finches, Zebra finches, Stubble quail and King quail. All said and done I am very happy with the “Outdoor” aviary. I’m seriously thinking of building my own. I have parakeets and I enjoy breeding them. Although I have a local pet shop that buys the young ones from me at times, I always have a few and my flight cage is simply too small for the numbers I have. I’m planning to use a spot in my yard I had for a large dog I owned. The spot is under shade trees and has a cement flooring measuring 10×8 ft. I’m thinking of using heavy gauge PVC piping as my frame. I’ve seen some 8×10 roofing panels that look attractive and will work. I’m sure the cement will protect them from critters digging to get in the cage but reading the above post, I’ll have to double up on the mesh leaving a space between them. These racoons are smart and will reach into the cage. I live in South Florida but we do have some cold fronts that come through during the winter months. Placing a Heat Blower on the outside facing the cage should be OK. I will continue to breed my birds in the breeding cages and just want the aviary as a large space for the younger birds to work out since I don’t clip wings. I like the idea of having a pond with gold fish or some form of running water in the cage. I wonder if the water will have bacteria that will harm the birds if they drink from it? I already know I have to trim my Avocado tree which is not far from the spot I plan to build the cage. Avocado is considered Toxic but are the branches and/or leafs as well? I live in north FL. Does someone have a good supplier? We built a huge outdoor aviary – 20ft. X 30ft. We used what we already had – chain link – because we have a small State licensed Exotic Animal Rescue Ranch. We stretched it over a Greenhouse frame which we had also. The entry door is on weights so closes quickly and we put a cow bell on it and lock. We have 30 acres of woods and in the woods are lots of huge grape vines. We used the grape vines and made a very large jungle gym for our parrots to climb on. Hanging on the grape vines are lots of toys and their food/water bowls attached. 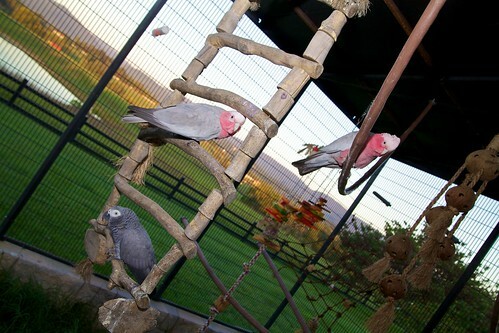 Inside the aviary, I have a yard swing where I can sit, swing and watch the parrots or hold them if they want. I also have a metal art table so when weather permits and the parrots can go outside, I can also do my artwork while watching them also. I NEVER leave them out at night even though the bottom of the chain link is sunk down into the ground and has very heavy aircraft cable strung thru it so nothing can dig under. I have a small outdoor pond with rocks around it inside the aviary also. The sound of the water moving, the goldfish, the sunshine the peacefulness is great for me and the parrots. Oh, yes, we also have 1/2 of it covered for shade so the parrots can get out of the sun when it is too hot. If I have to go in the house while they are out in the aviary, we built it where I can see it from our glass front french doors. Our winters do not permit them being outside then so we built an aviary room inside our big garage which is attached to the house. I can go directly from the house to the inside aviary. It has a very tall ceiling so again we attached grape vines hanging down from the ceiling for another big jungle gym and toys hanging from that. This way they are out of their cages alot all year round. Put a smaller preformed pond in it too with goldfish. Great place to relax, read and still spend a peaceful time with our parrots. I have a table in there where I work on teaching them tricks. I just love it! P>S> I know you said chain link is toxic but for lack of $ we had to use what we already had. They climb once in awhile up over the arch of the chainlink aviary greenhouse but most of the time they climb on the grapevine jungle gym.